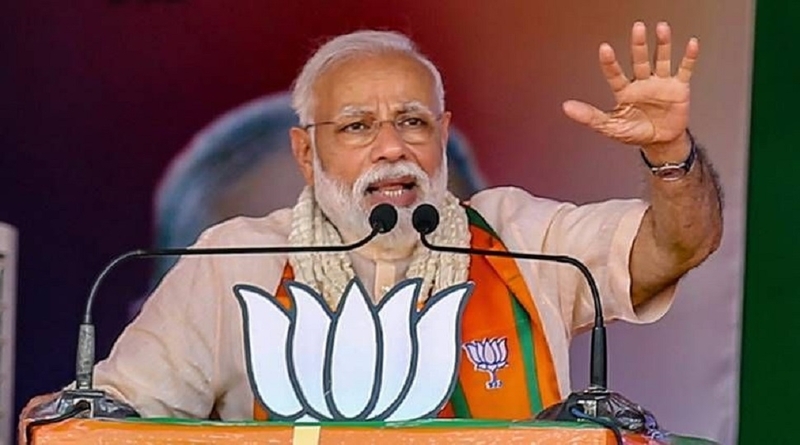 PRIME Minister Narendra Modi on Wednesday slammed the Congress over its manifesto promise to repeal sedition law and reduce forces from Kashmir. The Opposition party is trying to fulfill the demands of Pakistan, Modi said,adding the only“ business of Pakistan is to export terror.Are people who want to break the country into tukde- tukde (pieces) not anti-nationals? Congress is now saying that they will repeal the sedition law. Can we expect this from a 125 yearoldparty?,Modi said at a rally here. The BJP began using the phrase “tukde tukde gang” to refer to students accused ofraising anti India slogans in Jawaharlal Nehru University (JNU) in 2016 andhas generalised the phrase to attack those it accuses of sympathising with Maoists and separatists. The Congress manifesto is totally opposite to the thinking of Sardar Patel.If he was alive, he would have rejected this manifesto.They are a bus in gourarmed forces. They want to reduce the strength o four forces inKashmir, he said. “This manifesto is an attempt to fulfill the demands of Pakistan,” Modi said.